De Kringwinkel ‘t Rad is a chain of six socially conscious second-hand shops located in West-Flanders. Through their central sorting warehouse in Ruddervoorde, they ensure that reusable items are collected, processed or repaired, and shipped to the various shops. Environment, employment and poverty reduction. Those are the three main objectives of De Kringwinkel ‘t Rad. ‘t Rad collects and resells reusable goods, as such contributing to the circular economy. It employs people with difficulties in finding a job. And the stores are accessible to low-income groups, making available to them original and affordable goods. Lean is not only useful for companies in the ‘regular’ economy but also for social economy organizations aiming to realize continuous improvement. ’t Rad, more specifically, wants to increase the efficiency of their central warehouse in Ruddervoorde, in order to save time and as such reduce costs. Because the more cost-efficiently they can organize their operations, the better they succeed in making affordable products available to those who need it. To improve and optimize warehouse design and product flows, Möbius cooperated with 180 DC Consulting Ghent. 180 DC is a student organization connected to the University of Ghent, with students voluntarily helping socially conscious organizations. Möbius provided specialized support. In the first phase of the project, we did a data-analysis to identify inbound and outbound product flows: ready to sell, for export abroad as second hand or waste). Every flow was quantitatively analyzed by volume and weight. Next, the results were compared to the space occupied in the warehouse. The product flows were also split into different product families to better understand the different quantities per family and their mutual ratio. 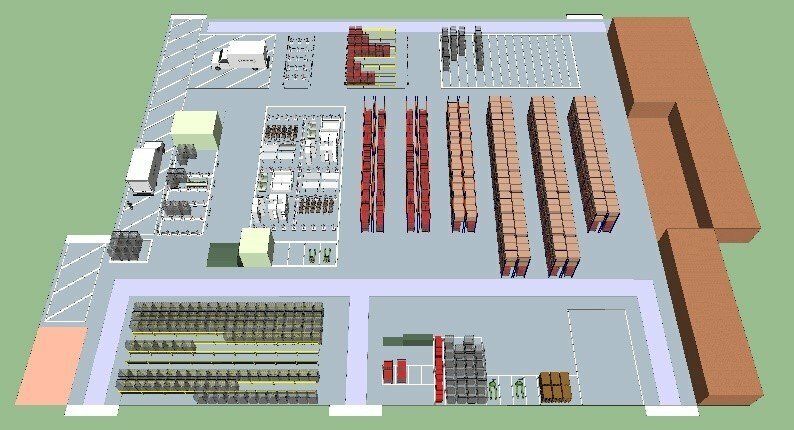 In a second phase we mapped the current design of the warehouse – including the different loading, unloading and stocking zones. The current flows of the different product families were then carefully plotted on the warehouse lay-out. Next, we identified further optimization possibilities by interviewing key employees. In a third and final phase, we conducted a thorough cost-benefit analysis for all suggested changes and investments. This facilitated decision making for the implementation of the new warehouse design. Standardizing used materials: The standardization of rolling containers to facilitate transportation across the warehouse and reduce the use of plastic foil. Optimizing warehouse processes: A suggested 5S and Visual Management guide to stimulate positive employee behavior (eg. neater work floor) and to have a clearer picture on the floor of the warehouse and its product flows. Redesigning the warehouse lay-out and product flows: We proposed a new warehouse lay-out that efficiently uses all available space and reduces employee travel distances. This project unmistakably provided added value for our company. A passionate young team carefully scrutinized our logistics center and delivered a very realistic proposal for improvements. Realistic because sufficient time was taken to map out the 'as is' (gathering & analyzing data, discussions with employees) and because possible limitations in the 'to be' were taking into account from the outset. The team’s fresh, substantiated proposal did not only produce a roadmap for 2019, but also brought new energy in ‘t Rad logistics team. Gates decided to consolidate the Industrial Power Transmission and Fluid Power Transmission divisions and at the same time redesigned its distribution model.